Hortus Camdenensis | Camellia sasanqua Thunb. 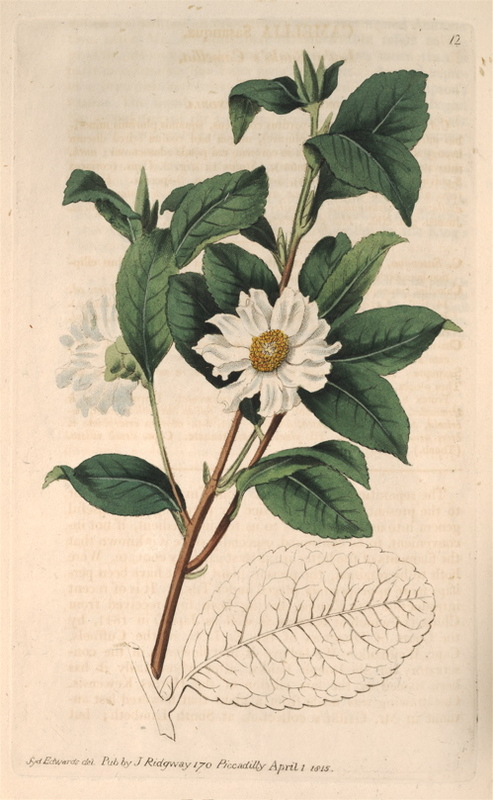 Fully-hardy upright to spreading shrub or small tree with elliptic leaves and fragrant, single, cup-shaped white flowers, 5-7cm across, in autumn. To 6m. Many cultivars exist in a range of colours. [RHSE, Hilliers’]. ‘A shrub with open branches, which are reddish and villous when young; leaves one inch broad and three long, alternate, oval, obtusely dentated, emarginated, thick, and of a dull green; flower small, single, comosed of five petals, of a beautiful white, sessile, terminal.’ [Berlèse Monography p.50/1838]. ‘It is of recent introduction to Europe, having been first received from China in 1811, by the East India Company.’ [BR f.12/1815]. C. sasanqua flore pleno was figured later, the plant supposedly introduced by Drummond in 1823. [BR f.1091/1827]. ‘Palmer’s Double Sasanqua’ was figured in 1819. This plant was introduced by Captain Rawes and grown at Thomas Palmer’s, Bromley, Kent. [BM t.2080/1819]. ‘A native of China and Japan, introduced about the year 1810. It is a slender shrub, with weak, pendulous branches, flowering in the autumn with us. Kaempfer mentions many varieties of this plant. [Camellia sasanqua pleno-carneo] was introduced from China: it is a beautiful kind, flowering freely, and the blossoms are peculiarly delicate and pleasing.’ [LBC no.1275/1828]. Listed in all published catalogues [T.277/1843]. A plant was presented to the Sydney Botanic Garden on December 24th 1845 [RBGS AB].